The attacks over the web continue unabated. 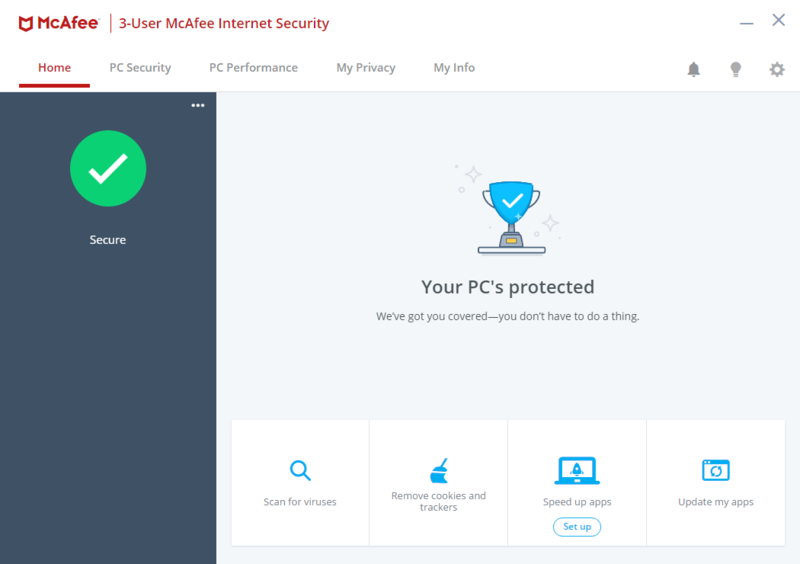 Everyone would do well to protect their PCs with a good Internet security suite. AV-TEST tested 19 suites for their protection effectiveness, thereby also testing their impact on performance and usability. A total of seven packages even achieved recognition as a TOP PRODUCT. Not a day goes by without a news report on malware attacks and ransomware. This involves not only large companies as juicy targets. 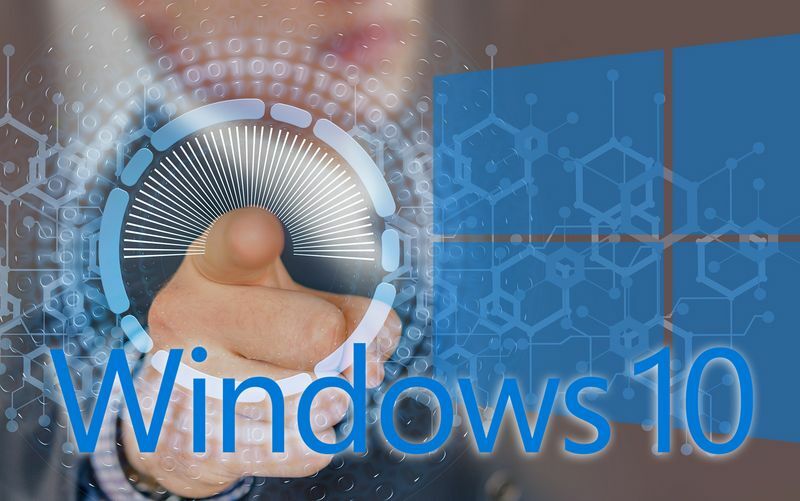 Private Windows PCs are also constantly in the crosshairs of attackers. After all, that is where users keep their valuable gaming accounts, access details to online banking or complete e-mail address books for proliferation. A very popular ploy is to completely enslave a PC as part of a botnet. This allows the PC to then be used as an attack drone or Bitcoin miner. Every PC user who does not want to become part of a botnet counts on a good security suite. Depending on the product, the protection packages offer many extra security features to more effectively safeguard everyday life on the PC. Of course, the laboratory cannot vet every single function of a product. To ensure that all packages are comparable, however, there are three large test categories: protection, influence on performance (speed) and the test for usability. The latter criterion mainly involves false positives. For each category, the laboratory awards a maximum of 6 points, thus up to 18 points for the entire test. If a product achieves top performance between 17.5 and 18 points, in addition to a security certificate, it is also recognized as a TOP PRODUCT. In the current test, 7 products were able to earn this special award. 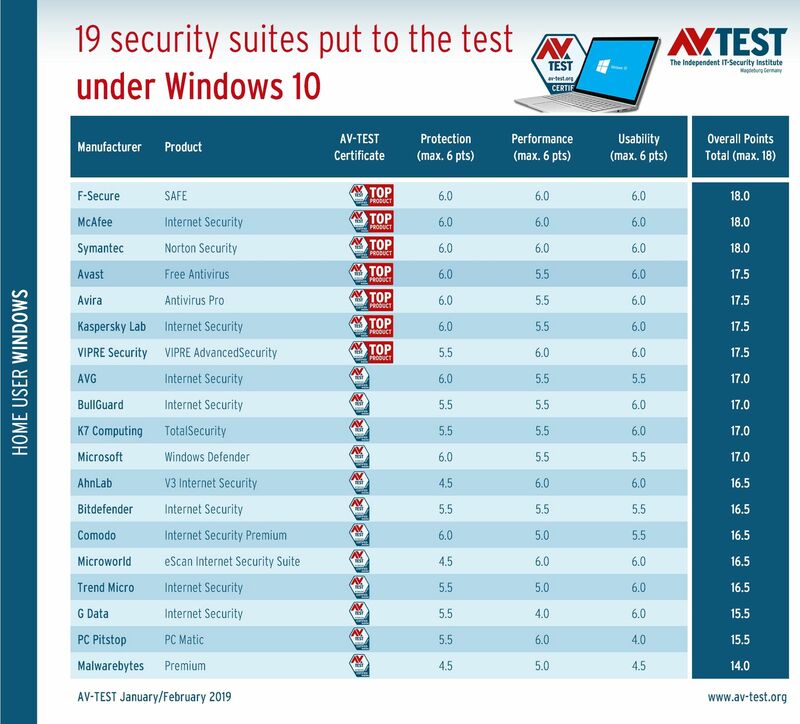 All other 12 packages earned a security certificate, as they greatly surpassed the minimum requirements in all test areas. 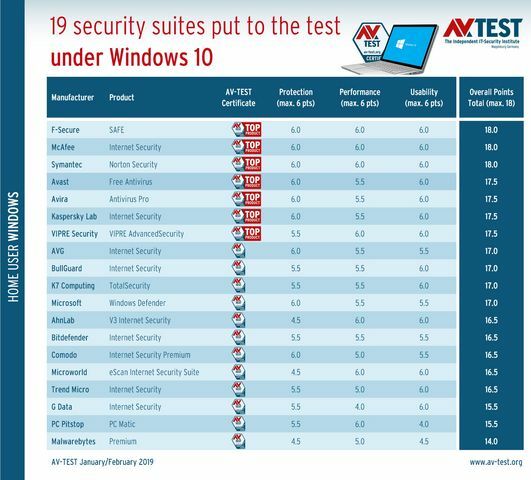 A total of three security suites completed the test with the maximum score of 18: F-Secure, McAfee and Symantec. They were followed by Avast, Avira, Kaspersky Lab and VIPRE Security with 17.5 points. The following 9 products achieved very good scores of 17 and 16.5 points respectively. The last 3 finishers still managed 15.5 to 14 points. The first test phase focuses on the protection effect of each individual package. The testers evaluate all the candidates in two steps: first in the real-world test with over 300 brand-new malware samples, and then with the reference set with almost 13,700 attackers. 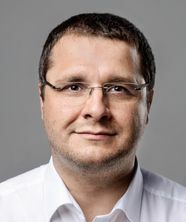 Naturally, the malware used in the test does not originate from the manufacturers, but was collected in advance by the laboratory with the help of honeypots and countless mails with attachments. Whereas the malware samples in the real-world test were sometimes only a few hours old, the reference set used malware up to two weeks old. Like all test phases, this was also completed twice: in January and February. The lower table lists the detection rates separately by month. The first 8 products were able to complete all tests involving protection with 100% detection each. These were Avast, AVG, Avira, Comodo, F-Secure, Kaspersky Lab, McAfee and Symantec. The package from Microsoft had tiny detection errors in a single test cycle. A total of 9 packages earned the coveted 6 points in the protection test. An additional 7 packages still received an excellent point score of 5.5. Only the last 3 solutions from AhnLab, Microworld and Malwarebytes achieved only 4.5 points. Performance killers or guardian angels? The next phase involving performance is very interesting, as it demonstrates that even protection packages having a high detection rate put only a minor load on the system. The packages from F-Secure, McAfee and Symantec are proof of this. Although they achieved 6 points in malware detection, they also earned a full 6 points in terms of speed. This is how the test worked: On two reference systems, a standard and a high-end PC, the following operations were performed and the system load was measured: files were copied gigabytes at a time, hundreds of websites were visited, dozens of downloads were performed, and many popular applications were installed and launched. Afterwards, the protection solutions were installed and tests were performed in the same way, thereby comparing the values with those of the reference systems. In this category, the packages from VIPRE Security, AhnLab, Microworld and PC Pitstop also received the coveted 6 points. In a direct comparison in terms of detection, however, they exhibited weaker results, achieving only 5.5 to 4.5 points. An additional 11 of the 19 products tested received between 5.5 and 5 points. Thus, they only slow down the Windows test PCs very slightly. Under the test criterion of usability, the lab summarizes several tests: false warnings of websites, false positives in case of benign software and blocking of installations and program launches. As an initial step following product installation, 500 web pages are visited. In this criterion, all protection packages worked error-free. In the next step, the objective was to scan over 1.6 million clean files without any false positives. Avira, McAfee and Symantec managed to do so error-free. AhnLab, Avast, AVG, F-Secure, K7 Computing and Trend Micro detected only one file incorrectly. 9 additional products wrongly classified up to 4 benign programs. Given the high number of test files, these are very good results. Conspicuous in this test were only Malwarebytes with 20 and PC Pitstop with 67 false positives. This resulted in a significant deduction of points. Finally, several dozen popular applications were installed and launched under the supervision of each security package. Most of the products completed the task without committing any error: AhnLab, Avira, Comodo, G Data, Kaspersky Lab, Malwarebytes, McAfee, Microsoft, Microworld, PC Pitstop, Symantec and VIPRE Security. All other packages falsely identified only one single application and blocked it; for AVG, there were two applications. In the end, however, most of the products earned good point scores. 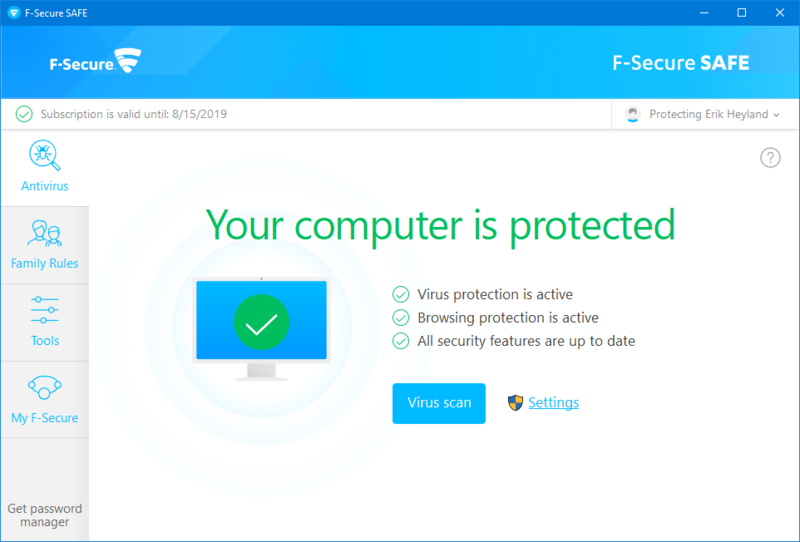 F-Secure, McAfee, Symantec, Avast, Avira, Kaspersky Lab, VIPRE Security, BullGuard, K7 Computing, AhnLab, Microworld, Trend Micro and G Data completed the test with a full 6 points. 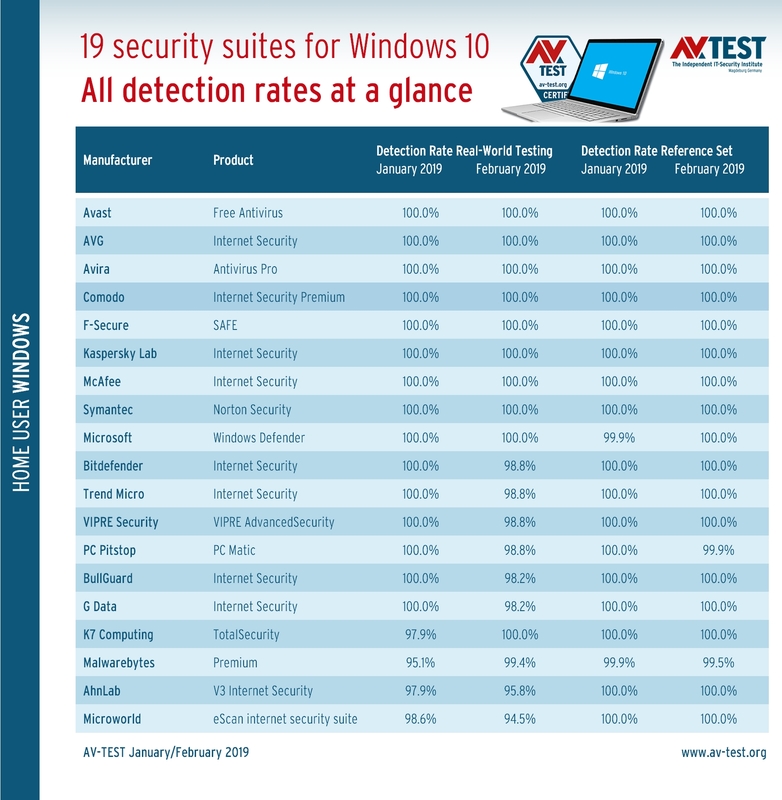 The final result of the tests indicates strong performance in most security packages. F-Secure, McAfee and Symantec delivered a perfect score of 18 points, followed by Avast, Avira, Kaspersky Lab and VIPRE Security with 17.5 points. That is why all these packages received additional TOP PRODUCT recognition. However, the large midfield comprising 9 packages still yielded impressive results of 17 to 16.5 points. G Data and PC Pitstop followed with 15.5 points, and Malwarebytes completes the table with 14 points. The test indicates that most of the products do an excellent job and reliably protect users. 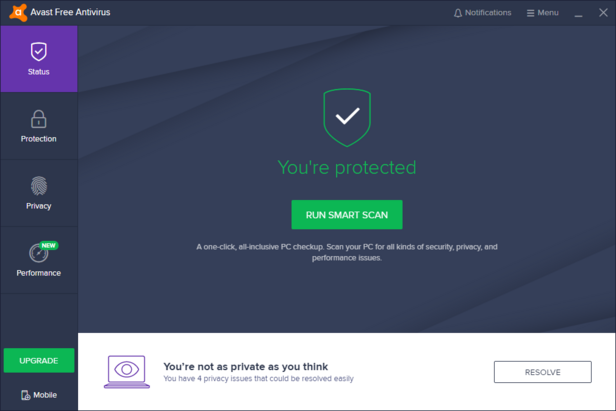 With Avast Free Antivirus, there is even freeware earning TOP PRODUCT recognition! Although there are more media reports on ransomware attacks on corporate users, there are still many attacks on private users. To be sure, attacks with ransomware on companies are more lucrative than on private users. However, it is well known that small things count in large amounts, which is why attacks on private users unfortunately also remain a source of income for cyber gangsters. Naturally, the manufacturers of security software are aware of the problem and also protect against current ransomware attacks. However, users can protect themselves additionally in several ways. Many companies offer free additional ransomware tools that can be used in parallel with protection software. The tools are available from Bitdefender, Kaspersky Lab, Trend Micro, Acronis or Malwarebytes. The best protection is still a backup to an external hard drive or an online service. If a USB hard disk is used, it is naturally not allowed to be always plugged in. Because in the event of a successful attack, every available drive is encrypted. Therefore, online backups are also recommended, as these usually run via an installed software agent. This conveys the backup into the cloud and is not available as a drive and therefore not accessible for ransomware. 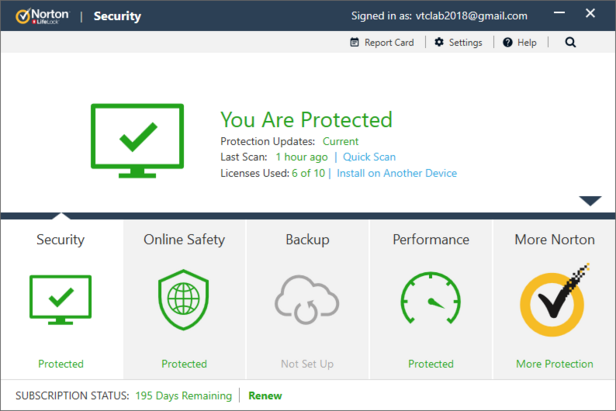 Known programs here are Acronis True Image or Novabackup.